Make yourself at home in one of the 229 air-conditioned rooms featuring minibars and flat-screen televisions. Rooms have private balconies or patios. Cable programming and DVD players are provided for your entertainment, while complimentary wireless Internet access keeps you connected. Private bathrooms with separate bathtubs and showers feature deep soaking bathtubs and complimentary toiletries. With an outdoor swimming pool, plus an a la carte restaurant, Splash Inn Nuevo Vallarta is located a 10 minute drive by car, from the beach in Nuevo Vallarta. It has a large on-site water park. Each room here features modern décor and comes equipped with a flat-screen cable TV, a wardrobe and a private bathroom with a shower and toilet. They overlook the gardens or swimming pool. At Splash Inn Nuevo Vallarta you will find a fitness centre, a children's playground and a laundry. The beach can be reached in a 10-minute drive and tickets for Splash Water Park are included for all guests. Nayarit Golf Course is just a 5-minute drive from the property, while Licenciado Gustavo Diaz Ordaz International Airport is about 8 km away. Free parking is available at the property. Welcome to Casa Virgilio Hotel Bed and Breakfast, Casa Virgilio is located in Nuevo Vallarta within the Riviera Nayarit and is just minute’s north of the Puerto Vallarta Airport (PVR). My new Hotel Bed and Breakfast is the perfect setting for couples, singles or large groups. At Casa Virgilios Hotel Bed and Breakfast, I want you to feel like family and I welcome you to the use of the fully equipped kitchen, outdoor cooking areas, swimming pool or any number of common areas available.. If you prefer a relaxing more private accommodation, Casa Virgilios is perfect for you. All of the rooms have private restrooms and kitchenettes allowing you to enjoy peace and quiet. Casa Virgilios is in a great location, located near El Tigre a world class golf course, beautiful sandy beaches, grocery and convenient stores. At Casa Virgilios there is little need for car travel, yet a short taxi or public bus ride will allow you to take in all the beautiful sights Puerto Vallarta has to offer. The hotel is located 5 km from the city of Puerto Vallarta. Only 1 minute distance available public transport and there are shops and shops walk 10 minutes from the hotel. All services are available in the area and the hotel has transport service. 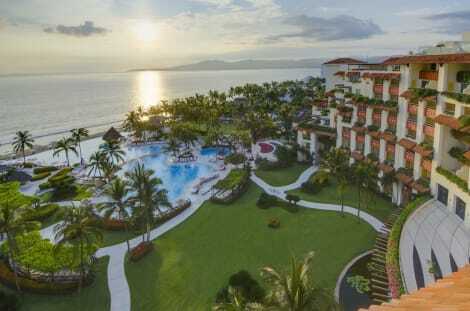 The complex situated 25 km from the airport in Puerto Vallarta. It is a hotel with informal elegance and a youth spirit that create a unique, experience with excellent swimming pools, a challenging golf course and stunning sea views allow you to the hotel interlacing perfection with casual fun and luxury in a resort paradise. The hotel has 180 rooms well equipped and decorated in a traditional style with beautiful views to the beach or the gardens. All rooms are equipped with a bedroom with 2 double beds, balcony overlooking the ocean or garden, private bathroom with shower/bath and hairdryer, air conditioning, satellite/cable TV, telephone, safe and ironing set. The resort offers an outdoor seasonal heated swimming pool, a children's swimming pool and a swim-up bar. Aqua fit is offered, and sun loungers and parasols are provided by the pool. Parasols are also available on the sandy beach. There is a gym, and massage and spa treatments are offered around our resort complex (fees apply to all) Ocean Breeze provide schedule transportation throughout the complex. Available water sports include jet skiing, diving, windsurfing, sailing and catamaran boating (fees may apply to all). Other sporting options include table tennis, pool/snooker, handball, volleyball and beach volleyball. Golfers will find the El Nayar Golf Course just 250 m, or 5 minutes' walk away (fees apply). In addition, entertainment programmes are offered for both adults and children. Make yourself at home in one of the 490 air-conditioned rooms featuring kitchens with refrigerators and microwaves. Complimentary wireless Internet access is available to keep you connected. Conveniences include safes and coffee/tea makers, and housekeeping is provided daily. Featured amenities include a computer station, dry cleaning/laundry services, and a 24-hour front desk. This property has 3 meeting rooms available for events. A roundtrip airport shuttle is provided for a surcharge (available 24 hours), and free valet parking is available onsite. lastminute.com has a fantastic range of hotels in Riviera Maya, with everything from cheap hotels to luxurious five star accommodation available. We like to live up to our last minute name so remember you can book any one of our excellent Riviera Maya hotels up until midnight and stay the same night.